This feature generates a report of all assets at the company's disposal with the value at the time they were acquired. 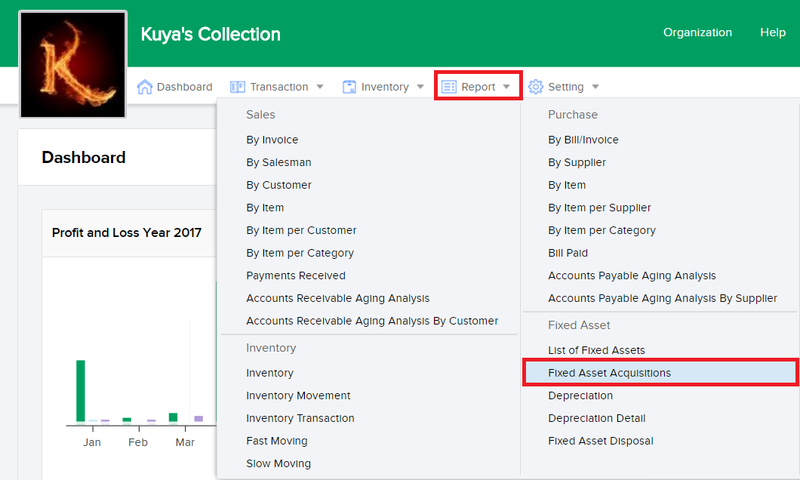 To start using this feature, start by clicking on the Report tab and then choose Fixed Asset Acquisitions as shown below. 1. Use the From and To column to set the acquisition data range of the assets you wish to include on your report. 2. Use the Asset Type column to filter the types of assets in your report. 3. Use the Location column to filer the assets you have based on their location. 4. Use the Classification column to filter your assets based on their classifications. 5. Click on View to generate a report based on your preferences. 6. Click on the Print button and choose Print Excel to print your report into an Excel file format. Choose Print PDF to print your report into a PDF file format. 7. Click on Send Email to directly email the report you have just generated.